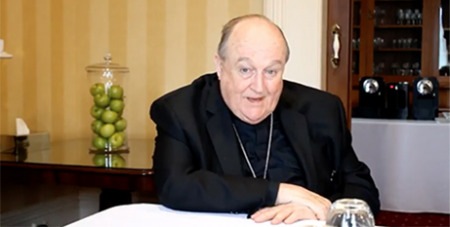 In discussing the Church's Plenary Council 2020, Adelaide Archbishop Philip Wilson has compared the Church in Australia to the blind man Bartimaeus who asks Jesus to give him his sight and then becomes his disciple, The Southern Cross reports. In his latest monthly video podcast, Archbishop Wilson said the Plenary Council 2020 has been a long time coming, and was a fruit of the Church's Year of Grace in 2012. "When we ask ourselves where the Australian Catholic Church is today, the Scriptures help us to understand our situation. In the Gospel there is a story about a blind man called Bartimaeus who was lying on the side of the road and as Jesus walked by, he asked him to give him his sight. What’s interesting about this is that Bartimaeus is the only person in the Gospel cured by Jesus who immediately began to follow him as his disciple," Archbishop Wilson said. "The Catholic Church in Australia is like Bartimaeus; we are on the side of the road, Jesus is going past, we are calling out to Jesus in our prayers and in our actions to discover what it is he wants us to see and to help us to do what we need to do to be his best disciples today. The Plenary Council is an opportunity for the bishops to lead and to carry out the responsibility they have as the shepherds of the Church but they are asked to do that in conjunction with all the people who belong to our faith." Archbishop Wilson said there must be a comprehensive consultation process in the lead up to Plenary 2020. "Any process towards a plenary council that is an action of the bishops must be something that is done in consultation, and with the engagement of, all our people. I know this is right at the heart of all the people and processes that are going on now as we clear the decks and get ready for the Plenary Council."